“In the face of Amazon​.com, book­store clos­ures, self-pub­lish­ing options, and shrink­ing lib­rary budgets, who is pub­lish­ing art books and how are they reach­ing con­sumers and research­ers alike? Com­mer­cial pub­lish­ers and dis­trib­ut­ors, as well as inde­pend­ent and grass­roots organ­iz­a­tions, must con­front the sea-change in how read­ers inter­act with the prin­ted word. E-books and oth­er digit­al formats are gain­ing in pop­ular­ity for fic­tion read­ers and an increas­ing num­ber of aca­dem­ic dis­cip­lines, yet very few art books meet the digit­al demand, even as more images of art are avail­able online. Moreover, art books remain expens­ive to pro­duce due to the neces­sity of high-qual­ity, and often high-priced, image repro­duc­tions, among oth­er vex­ing issues. The pan­el fea­tures lead­ing fig­ures in the rap­idly chan­ging world of art book pub­lish­ing, includ­ing Mar­garet Chace, Asso­ci­ate Pub­lish­er, Skira-Rizzoli; Paul Chan, artist, Founder of Bad­lands Unlim­ited; Shar­on Galla­gh­er, Pres­id­ent and Pub­lish­er of Art­book D.A.P. ; and Chul R. Kim, Asso­ci­ate Pub­lish­er, The Museum of Mod­ern Art. 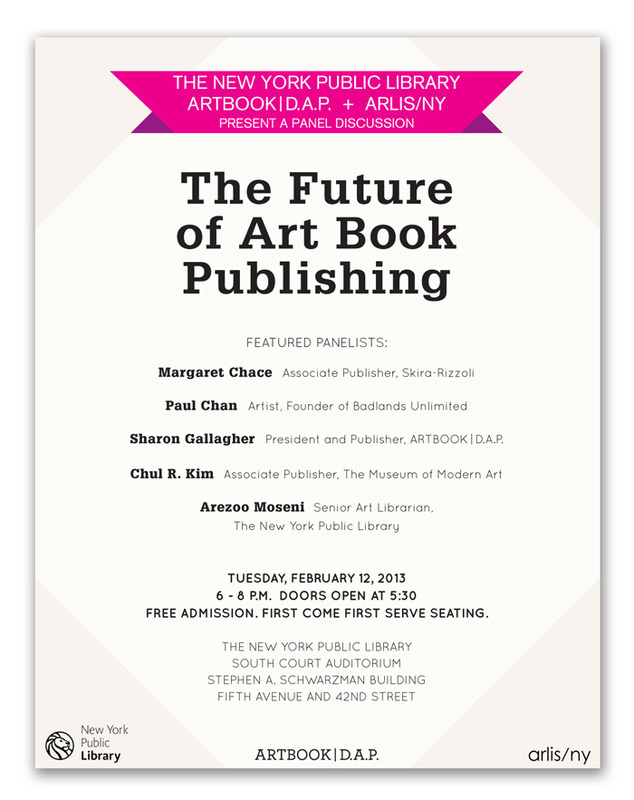 The dis­cus­sion is mod­er­ated by Are­zoo Moseni Seni­or Art Lib­rar­i­an at The New York Pub­lic Lib­rary.